The Gulf Fritillary, often seen locally in the late summer, is often seen in September migrating to the Gulf coast in great numbers and is a thrill to watch. It's always a delight to see a Buckeye. 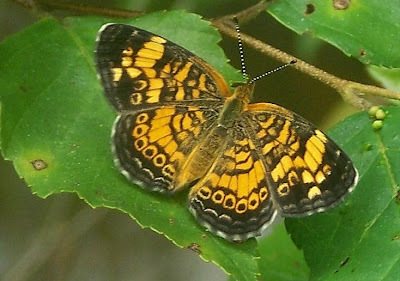 They are one of our most distinctive eye-spotted butterflies. To say I am thrilled when I find one of these beautiful Zebra Swallowtails dining in our garden. They are what I consider "nervous" butterflies in that they seldom simply stop on a flower and cease beating their wings. They also are quite flighty and getting close to photograph is often a trial.